Our first big update is out, and we've been busy all weak dealing with the feedback, bugfixes and overall gameplay improvements we had planned since our demo launch last week. Below you'll find a full list of the changes going from v0.1 --> v0.2, these are divided into new features, changes to mechanics & bugfixes. COMPLETELY REVAMPED PUSH ANIMATION AND MADE IT AWESOME! Nothing more to explain, just check it out! Feedback to when you have push power FINALLY added! NEW SPEED RUNNING FEATURES & CHANGES! 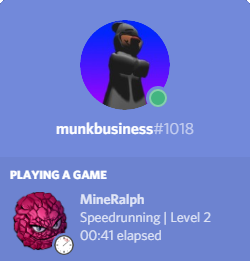 ADDED A NEW BUTTON FOR SPEEDRUNNING! Now you can press "P" while in a "speedrun" (the button from options), this will instantly restart the speedrun, without all the fades and screens and get you back into the action without wait. Improved Ralph hit detection on surfaces, you should now have a more smooth experience going up/down/around edges and increase the overall momentum slightly. Changes to almost all the levels with improvements and feedback given from people. Some parts made a bit harder, some parts made a lot easier (mainly level 7 made much more smooth)! BACKUP YOUR SAVE FILES IN CASE WE FUCKED SOMETHING UP! As always, give us lots of feedback on the changes. Did you like the new images/animations? The best way to get a hold of us is through our discord (which you can find on the game site)! Keep up the feedback and we will keep fixing the stuff as fast as we can!